Elvis Presley, the man who jump-started the rock-and-roll revolution from a tiny Memphis recording studio in 1954 and went on to become the world's most recognizable entertainer, died Monday, August 6th, of cardiac arrest, at his Horn Lake, Mississippi, home. He was 72 years old. It had been six years since an earlier heart attack sent the man many called "The King" into a mini-retirement and 30 years since a drug overdose threatened his life, then in chaos, and forever altered his career: cleaning up, breaking from his iron-fisted manager, "Colonel" Tom Parker, and withdrawing from the music world for several years. Upon his return to public life in the 1980s, Presley mixed sporadic but high-profile concert and record appearances with a series of non-music business ventures, including an ownership stake in the NFL Memphis Hound Dogs. In the 1990s, Presley returned to regular performances with a residency at the Hilton Hotel & Casino Tunica, setting the stage for a dramatic return as a musician and film star in the final decade of his life. "Right Next Door to Dead"
On August 16th, 1977, Presley was found at his Graceland home around noon — unconscious and unresponsive — by fiancée Ginger Alden. According to never-confirmed rumors, Alden discovered Presley lying on the floor of his bathroom; all he would say later was that it was "a shameful scene." Rushed to Baptist Memorial Hospital by paramedics, Presley, apparently a victim of a prescription drug overdose, slipped into a coma, and fears were high that he might not survive. In a statement on the steps of the hospital, Presley's father, Vernon, announced to the world, "My boy may not make it." Presley himself later said he was "right next door to dead." But the next day, Presley awoke and was discharged from the hospital three days later. He checked into Hazelden Clinic in Minnesota, a leading drug and alcohol abuse rehabilitation center, where he would stay for a month. Back at Graceland by October, Presley began picking up the pieces of his life. His manager, "Colonel" Parker, wanted Presley back on the road or in the recording studio. (A tour had been scheduled to begin August 17th, but Presley's hospitalization led to its cancellation.) Desiring nothing more than to be left alone and fearing a return to his previous lifestyle, Presley refused. A bitter argument erupted, resulting in the severing of ties between the two — though Parker always maintained that he quit rather than being fired as Presley's manager. One relationship that was strengthened following the overdose scare was that of Presley and Alden. On February 16th, 1978, the couple married in a low-key ceremony at Graceland. But, with a constant stream of fans, visitors, and well-wishers ouside the gates, Presley felt increasingly trapped in his home on what, in 1972, had been officially changed to Elvis Presley Boulevard. Presley wanted somewhere he could go and be outdoors and not have to worry about the prying eyes of the world. The clincher came with the announcement that Ginger was pregnant. Remembering fondly his time spent at the ranch he once owned in the mid-to-late '60s, the Circle G, near Horn Lake, Mississippi, Presley arranged to re-acquire the 160-acre property. In 1979, Presley, a seven-months pregnant Ginger, and Vernon moved to the ranch. His daughter, Lisa Marie, continued to divide time between Mississippi and Los Angeles, where Elvis' ex-wife, Priscilla, lived. On June 19th, 1979, Jesse Vernon Presley — named for Elvis' father and his stillborn twin brother, Jesse Garon — was born. Ecstatic at being a father again, Presley and his family settled into a comfortable life on the ranch. Presley continued to explore spiritual and religious matters, and he began to physically reverse the toll drug abuse and unhealthy living had taken on his body. He ate healthier and began to exercise, practicing martial arts and taking morning jogs on his property. It is said that this was the happiest time of Presley's life. By the early 1980s, a dwindling cash reserve — due to a stagnant back catalog and no new music-related income — prompted Presley to re-engage with the outside world. He began with a non-music business venture: a chain of Southern-themed fast-food restaurants called Gladys' Kitchen. Named for Presley's late mother, the first Gladys' Kitchen opened its doors at 1447 Union Avenue in Memphis in 1980. In preparation for Friday's memorial service, Elvis Presley's son, Jesse Vernon, cleans up at the south gate of the family estate, the Circle G Ranch. Presley died of cardiac arrest at his home on Monday. The signature item on the menu was a fried peanut butter and banana sandwich. Hamburgers topped with peanut butter or pimento cheese were also featured. After success in Memphis, Gladys' Kitchen expanded across the Southeast, boasting 18 locations by early 1982. But the venture saw its gains turned back shortly thereafter. The blow came from New York Times food critic and fellow Mississippi native Craig Claiborne, who famously gave Gladys' Kitchen a zero-star, one-word write up: "Godawful." Folding almost as quickly as it had appeared, even the original (and last remaining) Gladys' Kitchen shuttered by 1984. It's now a Taco Bell. Two other business opportunities proved more fruitful. 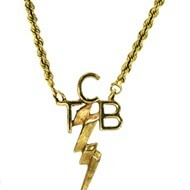 The first was the brainchild of Presley's high school friend, George Klein. Listening to Elvis ruminating on what to do with Graceland, Klein made a wild suggestion: Turn Graceland into a Cadillac dealership. And so, in October 1983, George Klein's King Cadillac opened its gates on the renovated grounds of Graceland, selling new and classic models of the automobile. The co-venture was a moderate success at first — those weren't great years for the American auto industry — but in time, Klein's King Cadillac gained a cult following, especially for its trademark custom-pink models. A status symbol of sorts for celebrities and fans, car buyers at King Cadillac included, over the years, Nicolas Cage, Johnny Depp, Axl Rose, and Quentin Tarantino. The second business venture secured Presley's finances far into the future. Long a loyal consumer of Mountain Valley Spring Water, Presley took a financial plunge in the company in 1987. Headquartered in Hot Springs, Arkansas, until investors moved it to New Jersey in 1966, Mountain Valley Spring Co. was acquired by Elvis Presley Enterprises and returned to its original home. Presley's investment proved vastly profitable, riding the wave of the bottled-water boom that continues to this day. In the aftermath of the Gladys' Kitchen debacle, Presley made a difficult decision: His father was replaced as his business manager. Then 66 years old, Vernon was well-intentioned but in declining health. His replacement: Jerry Schilling, a longtime Presley friend and the youngest member of the "Memphis Mafia" entourage before it was effectively disbanded. An experienced manager of the Sweet Inspirations, the Beach Boys, and Billy Joel, Schilling came to Presley with a proposition: It was time to get back in the recording studio. Presley resisted initially — he hadn't sung into a microphone in nearly six years. But Schilling convinced him to enter the friendly confines of Sam Phillips Recording Studio in Memphis with producer Chips Moman for a one-day session on December 21, 1982. Though the session didn't yield any finished recordings, it was seen in the music industry as a watershed moment for the King, creating ripples of excitement among insiders. A few months later, performer/producer Barry Gibb contacted Schilling with an overture to make an album of new songs with Presley. Intrigued, Presley agreed to travel to Nashville to record one song: "Islands in the Stream" — written by Barry, Maurice, and Robin Gibb — as a duet with Dolly Parton. The song would go on to be the first single from her album Burlap & Satin. Of the recording session, Presley quipped to a reporter, "It's like riding a bike — and I ain't rode nothin' but a horse for a long time." 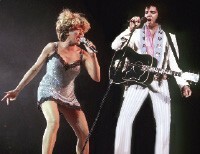 Presley and Tina Turner perform "Proud Mary" at "Live Aid," on July 13, 1985. This was Presley's first public concert appearance since June 26, 1977, at Market Square Arena in Indianapolis. "Islands in the Stream" was released in August 1983, the first new Presley recording since 1977, and was a smash success. The record hit #1 on October 29th and stayed there three weeks before being supplanted by Lionel Richie's "All Night Long." "Islands in the Stream" was Presley's first Top 40 hit in the U.S. since "Way Down" in 1977 and his first #1 since "Suspicious Minds" in 1969. Named Song of the Year by Billboard, "Islands in the Stream" also won a Grammy for Pop Vocal Group Performance and an American Music Award (AMA) for Favorite Country Song. But with a return to musical success came sadness. Vernon Presley, then 67 years old, died of heart failure March 15, 1984, at the Circle G Ranch. He was buried at the ranch next to Elvis' mother, Gladys, who had been moved there from Forest Hill Cemetery in Memphis years before. His father's death deeply affected Presley. He spent more time with Ginger, Jesse, and Lisa Marie, and he sought solace in his friendships with longtime friends, especially Schilling and Klein. He also reconciled with Red West, Sonny West, and Dave Hebler, with whom he'd been estranged since they published their tell-all in 1977, titled Elvis: What Happened?. Presley's next foray into music would take place on a much bigger stage. With a famine ravaging Ethiopia, musician/activists Bob Geldof and Midge Ure organized "Live Aid," a global concert to benefit the hunger-torn nation. Musicians of every background responded to the call; Presley was no exception. 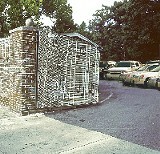 The ground of Graceland became George Klein's King Cadillac in 1983. In his first public appearance since 1977, Presley headlined the Philadelphia concert at JFK Stadium, on July 13, 1985. He gave the show finale in front of 90,000 attendees and an estimated 1.9 billion viewers in 100 countries, performing "In the Ghetto," "Burning Love," and, in a duet with Tina Turner, "Proud Mary." For most viewers, it was the first time they'd laid eyes on the new, slim, healthy Elvis. Memorably, many of the show's other performers, including Mick Jagger, Madonna, and Run-D.M.C., sat on the stage to listen to his set. Presley even gave the audience a bit of his infamous wiggling hips. Asked about it later, he said, "Rhythm is something you either have or you don't have, but when you have it, you have it all over." In September, Presley was back in the studio, this time turning back the clock with some old friends. The Class of '55: Memphis Rock & Roll Homecoming album matched Presley with his onetime Sun Studio compatriots, Johnny Cash, Jerry Lee Lewis, and Carl Perkins, the reunited "Million Dollar Quartet" who last played together by happenstance one day almost 30 years earlier. Recorded at Sun and produced by Moman, Class of '55 was a critical and commercial success upon its 1986 release (going on to be nominated for a Grammy for best album but losing to Paul Simon's Homeless). On January 23, 1986, Presley got what he called "the honor of a lifetime": induction into the Rock and Roll Hall of Fame. He was enshrined in the first class of inductees along with, among others, Sam Cooke, Jerry Lee Lewis, and Sam Phillips. Phillips caused controversy introducing Carl Perkins at the awards banquet, saying, "It's a late date to be saying it, and I mean no disrespect to the people of Cleveland, who I'm sure are a fine people and spirachul people — but Cleveland ain't ever gonna be Memphis." His remarks were in response to the Rock and Roll Hall of Fame Foundation choosing Cleveland over Memphis for the future site of its museum. Though the foundation was won over by a $65 million pledge from the city of Cleveland, a commitment Memphis and Shelby County governments were not willing to make, Presley drew local criticism from frustrated fans and business leaders who felt he could have exerted more influence over the selection process. In 1987, after a personal plea from actor Patrick Swayze, Presley recorded a duet single with Jennifer Warnes for the film Dirty Dancing. "(I've Had) The Time of My Life" earned Presley his second #1 hit of the decade — in as many tries. Nominated for an Academy Award for Best Original Song (but losing to "Nothing's Gonna Stop Us Now" from Mannequin), Presley and Warnes performed their number at the Oscar ceremony. At the close of the show, host Chevy Chase signed off, saying, "Ladies and gentlemen: Elvis has left the building — with Bernardo Bertolucci's Oscar. After him!" Also in 1987, U2 came calling on Presley. On a tour to support The Joshua Tree album and to film their documentary Rattle & Hum, the Irish group enlisted the talents of Presley, B.B. King, and Bob Dylan, among others, as musical tour guides for their paean to American rock-and-roll. Presley had met Bono during the "Live Aid" campaign, and Elvis, now accustomed to the return to the spotlight, was happy to be on film showing U2 around Memphis. Presley introduced the band to Sun Studios, but he turned down the opportunity to record with them there. Nevertheless, impressed by U2, he agreed in principle to work with them in the future. He didn't have to wait long. The next year, Bono returned with a song he'd written for Presley: "All I Want Is You." Presley recorded his part of a duet with Bono at Sun, and the song closed the soundtrack album Rattle & Hum later that year. The third single from the album, "All I Want Is You" also gave Presley a stake in another #1 hit. Elvis wasn't the only Presley claiming high-profile success. Ginger landed a semi-regular role on Knots Landing in 1985. But relocating part of the year to Los Angeles began to take a toll on their marriage. In 1987, Ginger accepted a role on L.A. Law, requiring her to spend more time in California than Mississippi. Presley refused to move to L.A. full-time, and Ginger refused to scale back the workload of her burgeoning career. Their relationship strained by a 2,000-mile forced separation, Ginger filed for divorce in April 1989. The couple shared custody of Jesse, who at 9 years old began to split time between his parents' homes, as his half-sister Lisa Marie had done years before. Still stinging from his second failed marriage, Presley would receive good news later that year: Lisa Marie wanted to move back to the Mid-South. Though Presley had not remained on good terms with Priscilla following her conversion to Scientology, he and his daughter remained close. With her homecoming, Lisa Marie would spark a joy and a desire for collaboration in her father that would bear fruit in years to come when Lisa Marie decided to follow in her father's footsteps. Mountain Valley Spring Water and George Klein's King Cadillac weren't the only non-musical business ventures Presley embarked on in the mid-'80s. He also began a decades-long foray into the world of professional football. 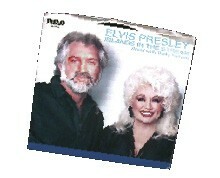 Elvis Presley and Dolly Parton's 1983 #1 hit single, "Islands in the Stream." A black belt in karate, Presley became identified with martial arts during that sport's boom in the 1970s, but his first sporting love was always football. Presley was a season-ticket holder for the Memphis Grizzlies of the short-lived World Football League, attending every home game during the 1975 season. He took a more active involvement in the sport in 1984, when he and Memphis cotton merchant William Dunavant purchased a franchise in the upstart United States Football League (USFL). The Memphis Showboats debuted at Liberty Bowl Stadium that June, but the era ended two years later with the dissolution of the USFL after the struggling league got an unfavorable ruling in a key court case against the dominant NFL. But Presley had gotten a taste for the sports business and wanted more. 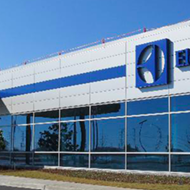 In 1991, Presley joined Dunavant, Memphis-bred venture capitalist Paul Tudor Jones II, and Federal Express founder Fred Smith in a pursuit team for a proposed NFL expansion franchise, the Memphis Hound Dogs. Still stinging from public criticism for his lack of hands-on involvement in Memphis' unsuccessful bid to land the Rock and Roll Hall of Fame, Presley took public lead of the NFL pursuit. In 1993, the NFL announced Memphis, Charlotte, Jacksonville, and Baltimore as finalists, eventually awarding teams to Charlotte and Memphis. On September 9, 1995, the Memphis Hound Dogs debuted before a sold-out crowd in a refurbished Liberty Bowl, renamed Vernon Presley Memorial Stadium, losing to the Cleveland Browns 21-10. Presley performed his "American Trilogy" at halftime of the nationally televised game. More than his musical triumphs or his return to movies, Presley cited the Hound Dogs as his proudest professional accomplishment during the latter decades of his life. "Football is the gift of the gods," Presley said of the sport. "It's like life in four-quarters time." 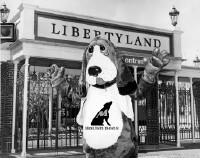 Before kickoff of the first Memphis Hound Dogs home game at Vernon Presley Memorial Stadium, team mascot Fetch celebrates at nearby Libertyland. A colorful and hands-on owner, Presley personally coaxed Jimmy Johnson, a Super Bowl-winning coach for the Dallas Cowboys, out of the TV studio to lead his beloved Hound Dogs. During home games, Presley was known to occasionally sketch plays from his old touch-football days and have them sent from his owner's box to the sidelines, where Johnson would playfully crumble them up and discard them. "This one will score, if it goes," Presley would typically scribble at the bottom of each play. A massive success, the Hound Dogs continue to dominate the regional sports scene as the only major professional sports franchise in Tennessee, despite failing to match the success of their 1999 season, when they lost to the Los Angeles Lazers in Super Bowl XXXIV. Even more than Presley's concurrent residency at the Hilton Hotel & Casino Tunica, the Hound Dogs are credited with spurring Tunica's rise as the country's second-largest gaming and resort destination. The presence of the Hound Dogs also spurred a massive redevelopment of the Memphis Fairgrounds complex, first with the refurbished Vernon Presley Memorial Stadium, then with Elvis Presley Enterprises taking over the troubled Libertyland amusement park from the city of Memphis, converting it into Graceland Fairgrounds. Presley kicked off the grand reopening of the park in 1996 with a trip on his favorite ride, the Zippin Pippin roller coaster. Graceland Fairgrounds continues to flourish today. On several occasions following recovery from his 1977 overdose, Presley received overtures from Hilton Hotels to resume his residency at the company's Las Vegas location. Wary of returning to a lifestyle that nearly cost him his life, Presley turned down Hilton repeatedly. But, in June 1990, the state legislature of Mississippi passed the Mississippi Gaming Control Act, allowing casinos to open along the Mississippi River. Hilton saw this as an opportunity to renew their relationship with Presley, opening Hilton Hotel & Casino Tunica, located less than 25 miles from Presley's Circle G Ranch, and reaching an agreement with Presley for a residency at the casino's 500-seat ballroom. On most Friday and Saturday nights over the next several years, Presley held court at the Hilton, playing with a band culled from Memphis-area session and club musicians. His daughter, Lisa Marie, became a regular part of his show, opening with solo sets of her own material and then joining Presley as a back-up singer and duet partner, typically closing sets by taking the Dolly Parton verses on "Islands in the Stream." The tenor of Presley's Tunica shows was far different from his Vegas residencies. Gone were the bejeweled jumpsuits, colorful scarves, and big-band set-up. Instead, Presley's shows were a more modest run-through of his hits with occasional forays into the gospel music he always cherished, performed largely for audiences whose backgrounds were more similar to Presley's own than his Vegas audiences had been. Less than a year later, the troubled municipal amusement park was taken over by Elvis Presley Enterprises and renamed Graceland Fairgrounds. 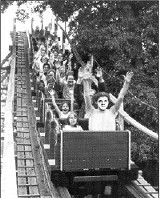 Presley, seated front, rides the Zippin Pippin to celebrate the reopening. Growing comfortable with his Tunica gigs, which allowed him to continue his music career while remaining close to his Mississippi home and, later, the Hound Dogs, Presley declined other offers to record or perform outside the area for most of the decade. One exception was Presley's participation on Frank Sinatra's 1993 Duets album, in which the King and the Chairman traded verses on "My Way." It was the first time the two vocal icons had worked together since the 1960 ABC television special Sinatra hosted to welcome Presley home from the Army. In addition to his role with the Memphis Hound Dogs and his run of shows at the Hilton Tunica, the '90s were notable for Presley because of a key, if unlikely, friendship he formed. Presley first met Arkansas governor Bill Clinton after his purchase of Mountain Valley Spring Water in 1987. A big fan of Presley's music, Clinton was anxious to meet the King, and the pair struck up an immediate friendship. When Clinton ran for president a few years later, Presley contributed money to the effort and made a few appearances at campaign rallies. After Clinton's election in 1992, Presley performed at the first inaugural ball, playing "Heartbreak Hotel" as the newly elected president joined him on stage to play saxophone. 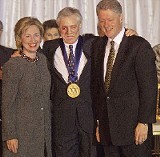 Over the years, Presley spent several nights at the White House, in the Lincoln Bedroom, and received the Presidential Medal of Freedom from Clinton in 1995. By the late '90s, Presley, on the wrong side of 60 and feeling the effects of his hard living decades earlier, seemed to be winding down his music career. His Tunica residency had become more sporadic, Lisa Marie had broken away from the show to pursue her own recording ambitions, and Presley seemed more interested in making appearances at Hound Dogs games than on the concert stage. But in early 1998, renegade country star Dwight Yoakam sat in with Presley while in Tunica for one of his own concerts and tried to coax the King back into the studio. Though Presley had recorded occasionally over the past couple of decades, he hadn't recorded a full album of new material since his 1977 drug overdose. Yoakam convinced Presley that a new album was a chance to reinvent himself musically in a way that he hadn't since his fabled "'68 Comeback," when Presley performed a stripped-down televised concert in full-body black leather then returned to Memphis for soulful sessions that yielded his classic "Suspicious Minds." Yoakam brought Presley to Nashville to record with his touring band. The album that emerged was a collection of bluesy roots-rock akin to Presley's 1969 Memphis sessions. Titled, cheekily, '98 Comeback, the album featured Presley covers of left-of-center country songs such as Lucinda Williams' "I Just Wanted To See You So Bad" and Yoakam's own "Guitars, Cadillacs." The album proved too country for pop and rock radio and too rock for country radio, but it garnered appreciative reviews and sold well. It also convinced Presley — who still refused to tour — to keep experimenting, launching a fertile period in which he released three wildly different but equally successful albums in four years. '98 Comeback was followed by 1999's Magnolia, an atmospheric, portentous set produced in Oxford, Mississippi, by rock veteran Daniel Lanois (who had co-produced U2's The Joshua Tree). On Magnolia, Presley interpreted familiar songs such as U2's "I Still Haven't Found What I'm Looking For," Chris Isaak's "Wicked Game," and, most surprisingly, British alt-rockers Radiohead's "Creep." The latter became a minor hit on modern-rock radio, though Presley later admitted to not really "getting" the song. Magnolia was nominated for an Album of the Year Grammy but lost to another comeback record from a veteran artist, Santana's less risky Supernatural. The two-way race between retirement-age artists prompted Grammy critics to refer to the broadcast as the "Grannies." Next, Presley returned to Memphis, recording locally at Ardent Studios for Blue, a soul album in which he was backed by legendary Stax Records house band Booker T. & the MGs, with guitarist Steve Cropper and organist Booker T. Jones producing. The album's lead single and signature song was a cover of Bill Withers' 1971 soul hit "Ain't No Sunshine." In the midst of this late-career resurgence, Presley's other passion hit a peak as well, as his Memphis Hound Dogs reached Super Bowl XXXIV on January 30, 2000, at Atlanta's Georgia Dome. In a game that signaled an era of changes for the NFL, the Hound Dogs squared off against another new-look franchise, the Los Angeles Lazers, the former Houston Oilers, who had relocated to California in 1997. The Hounds Dogs lost the game 24-23 as Lazers wide receiver Kevin Dyson lunged just across the end zone as time expired, pulling the Lazers to within 23-22. With no time remaining on the clock, the Lazers went for the two-point conversion and the win, quarterback Steve McNair running a bootleg play across the goal line for the 24-23 win in perhaps the most exciting Super Bowl ever. It was a bittersweet day for Presley, who sang the national anthem to open the game. This period of activity was punctured in the spring of 2001 when, a month before the release of Blue, Presley suffered a massive heart attack. Though he recovered from this second brush with death, Presley shut down all plans to help promote his new record and retired again to the Circle G. He was 66. In 1995, Presley received the Presidential Medal of Freedom from longtime fan and personal friend President Bill Clinton. When Presley finally re-emerged a year-and-a-half later, it wasn't music that brought him back, but the movies. Presley hadn't acted in more than 30 years, last appearing opposite Mary Tyler Moore in 1969's Change of Habit. Presley blamed the culture of the movie world for much of his substance abuse problems earlier in his career and had often derided the left-coast entertainment industry as "Hollyweird." But director Quentin Tarantino, whom Presley knew as an occasional customer at King Cadillac, talked Presley back onto a movie set with a part written expressly for him: Bill, a mysterious leader of a group of assassins who is targeted for revenge by an employee/lover whom he attempted to have killed. A charming, aging martial-arts expert, the character Bill tapped into both Presley's karate background and his status as an icon of cool. Though the movie, an action epic, was called Kill Bill, the character Bill was close to a cameo, with meager but crucial screen time that wouldn't put too much strain on a sexagenarian still recovering from major heart surgery. While Elvis was enjoying his return to the big screen, another Presley was staking out an acting career. After growing up around the Hollywood entertainment industry during his mother's stints on Knots Landing and L.A. Law, Jesse got his big break in 2003, landing the role of Ryan Atwood, a good-hearted kid from the wrong side of the tracks, on Fox network's teen drama The O.C. For the next couple of years, Presley's public appearances were few. He delivered a eulogy at a memorial service for his Sun Records mentor Sam Phillips at Memphis' Cannon Center for the Performing Arts in July 2003. The next summer, he deemed himself unable to perform at a 50th Anniversary of Rock and Roll concert at Vernon Presley Memorial Stadium. 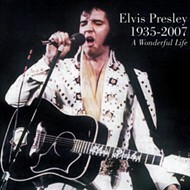 The concert, held largely in honor of Presley's own enormous contribution to American pop music, was broadcast live on HBO, and, though Presley didn't perform a set on his own, he was coaxed to the stage during the finale, joining longtime admirer Bruce Springsteen, old acquaintance Bono, and emerging hometown star Justin Timberlake for a medley of the King's hits. After the concert, Timberlake and Bono pitched Presley on the idea of doing his own duets album, akin to the Frank Sinatra Duets album Presley had participated in a decade prior. Presley agreed. The album, The King's Court, was recorded during a series of sessions at Memphis' Ardent Studios, with Timberlake and Bono performing and producing. Among the participants were Springsteen, Christina Aguilera, Sheryl Crow, and Rob Thomas. One of Presley's greatest legacies was his work with charities. He established the Elvis Presley Charitable Foundation, setting up music programs and scholarships for inner-city youth and working with Metropolitan Inter-Faith Association in Memphis to create and manage Presley Place, a development of transitional housing for the homeless. Following Hurricane Katrina in August 2005, Presley directed massive shipments of Mountain Valley Spring Water to New Orleans and the Gulf Coast to help with recovery efforts. In October 2005, Presley organized a benefit show at the DeSoto Civic Center in Southaven, Mississippi, with other first-generation rock stars, including Little Richard, Bo Diddley, Jerry Lee Lewis, Chuck Berry, and Fats Domino, himself a Katrina victim. Presley also became involved in Music Rising, a Katrina-affected-musicians charity. 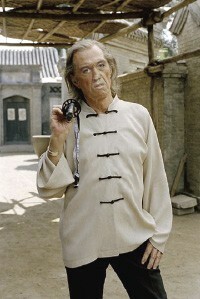 In a part written specifically for him, Presley returned to the big screen as the title character in Quentin Tarantino's Kill Bill. "Bill" was the first of Presley's roles to reference his martial-arts background. Presley hadn't starred in a film since 1969's Change of Habit. In recent years, Elvis had renewed frustrations with the influence of Hollywood on his family. His son Jesse got kicked off The O.C. 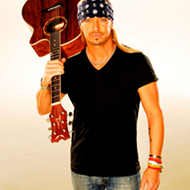 after two seasons due to drug problems and stayed on tabloid covers when he co-starred in the fifth season of the VH1 celebrity reality series The Surreal Life. Nevertheless, at the time of his death, Presley had two film projects in the works. He had signed on to return to the silver screen with a cameo as Daddy Lynn, the estranged father of the title character in Memphis director Craig Brewer's upcoming country-music-themed film Maggie Lynn. Presley was also involved in the long-gestating film biopic of his life, tentatively titled Burning Love and scheduled to begin filming in Memphis in 2008. Elvis Presley is survived by daughter Lisa Marie and son Jesse Vernon. He will be laid to rest next to his parents in Horn Lake, Mississippi, on Friday, August 10th.